1. The Options dialog is now a web page that opens in a new tab. Chrome has one less modal dialog and the new Options page is better suited for netbooks. Another advantage is that each section of the Options page has a permalink that can be bookmarked. 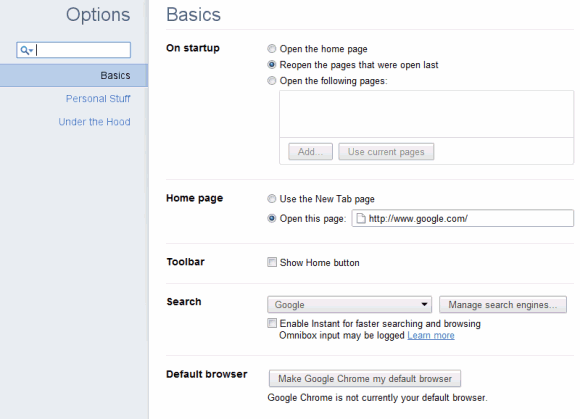 Even if Chrome doesn't have too many customizable settings, there's a search box that lets you quickly find an option. Try searching for "cookies" and you'll notice that Chrome finds settings that aren't immediately obvious. 2. You can now change the default page zoom value. Go to the Options page and select "Under the hood" (or paste chrome://settings/advanced in the address bar) and change the "page zoom" value. The default value is 100%, but you can pick values like 120% or 144%, which are useful if you want to connect your computer to a TV. 3. The same section of the Options page lets you change the minimum font size. Click "customize fonts" and choose one of the values that are available for the minimum font size. 4. Synchronize passwords and use them from any computer, as long as you can install Google Chrome. The new option is not enabled by default and it requires your confirmation before saving your passwords to your Google Account. There's even an extra security feature that lets you choose a custom encryption passphrase, so that your passwords are safe even if someone guesses your Google Account password. For advanced features and cross-browser functionality, try LastPass. 5. 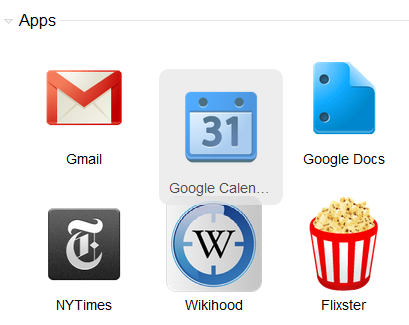 Reorder the apps from the new tab page using drag and drop. This option was available for the frequently visited pages and you can now use it to change the order of your favorite apps. 7. Chrome 10 comes with hardware acceleration for Web videos. "Traditionally, web browsers relied entirely on the CPU to render web page content. With capable GPUs becoming an integral part of even the smallest of devices and with rich media such as video and 3D graphics playing an increasingly important role to the web experience, attention has turned on finding ways to make more effective utilization of the underlying hardware to achieve better performance and power savings. There's clear indication that getting the GPU directly involved with compositing the contents of a web page can result in very significant speedups. The largest gains are to be had from eliminating unecessary (and very slow) copies of large data, especially copies from video memory to system memory. The most obvious candidates for such optimizations are the <video> element and the WebGL canvas, both of which can generate their results in areas of memory that that CPU doesn't have fast access to," explains Google. Test GPU acceleration for videos at YouTube's HTML5 site. Adobe Flash 10.2 also added full GPU acceleration for videos and YouTube is one of the sites that support this feature, so you can compare Flash 10.2 videos and HTML5 videos to see which version uses less processing power. 8. Chrome 10 for Windows finally sandboxes the built-in Adobe Flash plugin. This is one of the reasons why Google decided to bundle the plugin with Chrome. 9. If you didn't like Gmail's notification feature because it didn't work when you closed Chrome, you'll find it much more useful when Gmail's app adds support for background pages, a feature that's now available in Chrome. "Apps and extensions that use the new background feature can continue to run in the background — even if the user closes down all of Chrome's windows. Background apps will continue to run until Chrome exits. 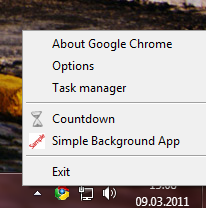 The next time Chrome starts up, any background windows that were previously running will also be re-launched. These windows are not going to be visible but they will be able to perform tasks like checking for server-side changes and pre-emptively loading content into local storage," explains Google. When you install the first app or extension that supports backgrounding (like this one), Chrome adds a new icon to the system tray (Windows and Linux) and a new entry in the context menu of the Chrome icon from the Dock (Mac). The new icon and context menu entry let you go to a background app, open the task manger or the options page. 10. Chrome disables certain outdated plugins by default and provides an option to update to the latest version. Popular software like Adobe Reader, Java or Apple QuickTime have many security vulnerabilities that are frequently exploited in the wild because users don't install the versions that fix these issues. serious problems until yesterday with email/chat notifications from Gmail, with official google chrome on linux desktop (ubuntu)..
someone doesn't know whom was copied. I don't think it's that important who implemented a certain feature first. The great thing about Chrome is that it changed the perspective on web browsers: they're no longer simple applications that render web pages. Browsers are now optimized for running web apps, they're increasingly fast, have simple interfaces, faster development cycles and have many features borrowed from operating systems. I wish IE would copy Chrome MORE. Developing is so much easier when you can say "I'm not going to support IE". While Firefox and Chrome have their differences, they're easy enough to work around. IE6 is like a groin kick every time you use it. Missing 'f' in the URL for background pages. The Chrome team does it again. Great work! "Chrome disables certain outdated plugins"
How does the password syncing compare with lastpass in terms of security and functionality? LastPass is much better because you can use it in almost any browser, there's a web interface, you can access recently used sites, there's an auto-login feature, you can create groups and multiple identities. LastPass even lets you export your passwords, a feature that's not available in Chrome. Another advantage is that your passwords aren't tied to your Google account. 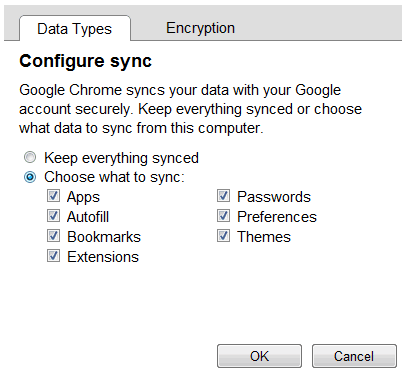 Chrome's password sync is a very basic feature that saves passwords to your Google account and makes them available to any other Chrome instance that uses the same Google account to synchronize data. Yeh I've been hoping for a Google equivalent of Lastpass which was cross browser and which you could use on phones w/o paying a subscription. I guess it's not there yet, maybe soon. Will the new Google Chrome support SimplePass biometric fingerprint reader? How about allowing me to control flash cookies and static cookies that are not completely stubbed out? Currently Chrome allows privacy with respects to the primary www.website.cookie. cookie only. (i.e. I want to deny the incompletely stubbed out cookie, website.cookie, which would prevent all of the following: tracking.website.cookie, stalking.website.cookie and advertising.website.cookie; the last one is probably why Chrome will never allow for this. Privacy is king, not just speed. ...now about flash cookies...oops does not do anything there either...huge fail. At least if your device allows for Linux root access you can redirect .adobe and .macromedia to /tmp (erased upon boot up in Linux by default). Which is only sudo Flash cookie control after a reboot. So if I use Google Chrome, I will always be forced to write scripts to open SQLLite DBs to clean up flash and not fully stubbed out cookies...and this is helping me how? Talking about security or privacy without addressing those seems a bit short sighted and ill conceived. background pages do concern me. Has anyone profiled the memory usage? No mention of the Web navigation API? or what it even does, other then possibly helping ad-blocker extensions. *whoops, Accidentally messed up my AOL openID. Chrome is rocking day to day with bunch of user friendly updates & features. I know most people don't have laptops to use these things, but these both are pretty fails - a) touch panning is implemented in firefox and ie pretty decently, and it's not like Mozilla is developing Android for tablets b) if I make some stuff like Verne doodle using modern technology, I make sure, it works in my own browser. I think this is so informative it can help me much! @omnicolor I'm with you there. Currently developing a web based game with HTML5 CSS3, not bothering with IE. One of the many things I like about Chrome is that it's always up to date. Chrome is one of my favourite Google products... it speeded up and refined Web browsing in the same way that Gmail did for email. Hi all. As much as I love Chrome, I've been literally forced to use X-Marks for syncing my bookmarks between Chrome on my many PC's. Chrome claimed to have this feature a long time ago, but it was so buggy that it would destroy bookmarks, clone them by the thousands, and block GoogleDocs features. It was hell and then some. Google would not even address the problem other than to not use Chome. So my question, is... Does bookmark syncing work at all yet? If so, I'll finally be at least 90% satisfied with Chrome. It's my browser of choice and I love it. Does Chrome 10 support MP4, WEBM still for HTML5 video? Chrome 11? Man that's old school. I've been using Chrome 12 for at least 100 years. I am a loyal Chrome user and with the new features I will like it more. Changes in zooming and password synchronization are great! After the latest update to Chrome, I am unable to use it - it doesn't work in either normal or incognito mode. The browser starts, no pages load (it appears to be loading my home page - iGoogle - but it never actually loads), and memory usage begins to climb - I usually kill it after it reaches 600 MB or so. I tried uninstalling and then installing again to no avail. I'm running on Windows 7 x64. Any ideas? Have Chrome 10. The entire URL for web pages is missing in the URL bar. What happened? How can I get the URL to appear again? When opening a new tab, which is a custom speed dial start page supporting keyboard shortcuts, the url bar is blank and the page is not focused anymore like before. How to make it work like before? Yeah, that's nice, but where's "Print Preview"????? I've just discharged Google Chrome don't ask the number it must be number 10 or so, I can't say it is not minimalist it can't be a download 174 MB weight being foxfire one of the most heaviest downloads it is only less than 30 MB will you please say something about it? And so where can we download it? Will there be a beta or something similar?